Former Conservatoire graduate, now Captain Daryl Powell RM, makes a welcome return to Birmingham as Director of Music of The Band of Her Majestys Royal Marines Scotland to lead a concert of popular and entertaining band favourites. With their distinctive white helmets, Royal Marines bands are known for their exceptional music making, visual grandeur and precision drill. Expect majestic fanfares, popular classics, big band, the spectacular Corps of Drums and entertaining solo features from the Band of Her Majestys Royal Marines Scotland and the Birmingham Conservatoire Wind Orchestra. Sharing the conducting duties with Chris Houlding, the concert will be a feast of martial music with a maritime theme with music including The Captain General, Abide with Me and a Barbra Streisand medley, concluding with Rule Britannia and A Life on the Ocean Wave. Daryl Powell was a student at Birmingham Conservatoire during the 1990s, studying cornet with Phillip McCann. After a spell as a teacher and conductor in Dorset, he joined the Royal Marines Band Service in 1995 and toured to Norway, Sweden and Hong Kong. In 2002, after briefly joining the band in Plymouth, he found himself deployed as a member of a Breathing Apparatus Rescue Team in response to the national fire brigade strike. Since then, he has spent time in the bands at the Commando Training Centre Royal Marines, Plymouth and has served as the Volunteer Band Instructor on board HMS Illustrious. He became Director of Music of The Band of Her Majestys Royal Marines Scotland in September 2015. 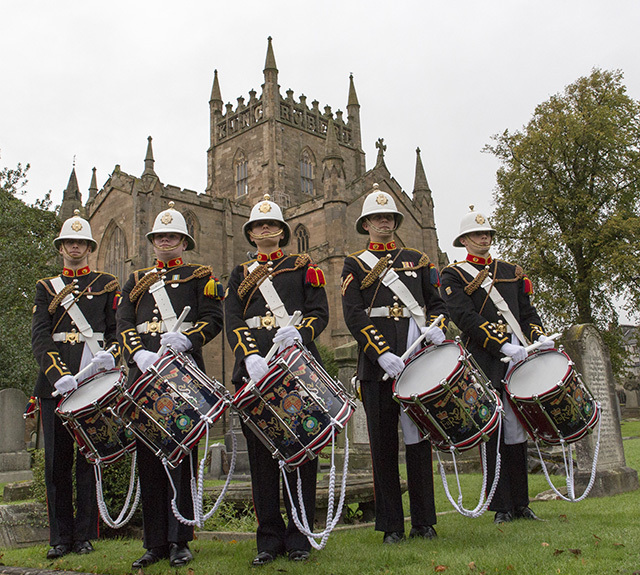 The band itself is based at Rosyth and, like all Royal Marines bands, most members play at least two instruments and perform in wind band, marching band, big band, orchestra and dance band combinations. The only Royal Marines band based north of London, they travel throughout Scotland, Northern Ireland and the North of as well as abroad. It has regular ceremonial duties including the Royal Edinburgh Military Tattoo, beating retreat on Horseguards Parade, ship launches, homecoming parades and remembrance services. It also gives numerous concerts throughout the year.